Home / News and Events / News / Difference/s Now? Western thought has long presupposed an idea of difference—culture/nature, human/animal, man/woman, mind/body—where difference was formulated from the standpoint of the same. Recently, in disciplines as varied as philosophy, social/cultural theory, politics, anthropology and literary theory, thinking difference has been systematically challenged from the point of view of the different. Projects have emerged to liberate difference from its implication in dialectics, in humanism, and in other grand narratives of being and becoming. These projects have accompanied various political and social movements—anti-colonial, anti-racist, feminist, queer, anti-capitalist—as they travel their own specific routes across the planet. The differences that define our social and political worlds, however, outpace our intellectual paradigms, calling into question the analytical accuracy and ethical certitudes of the latter. The emergence of discourses of difference may thus, paradoxically, mark the limit of a certain kind of thought of difference, signaling the need to forge other languages and models for thinking the difference-identity paradigm. Following upon History of Consciousness’s previous focus on crises in the cultures of capitalism—and in in dialogue with the emergent program in Critical Race and Ethnic Studies—this concentration addresses several problematics issuing from and in tension with these crises: the operation of capital on difference; the identity/difference paradigm and alternatives to it; the convergence of groups and social movements in resistance that elude both coalitional and alliance-based modalities of organizing; and the conceptual challenges posed by confrontations with historical and planetary actors beyond or beside the human subject. 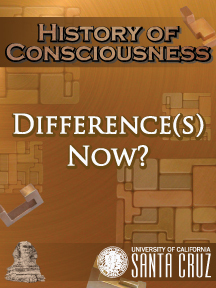 The second History of Consciousness initiative, Difference(s) Now?, embraces these dilemmas and the challenges they pose. Through graduate courses, reading groups, and symposia, we plan to rethink difference in a variety of cultural, philosophical, ethical and political projects. Ultimately, the initiative will explore the question of difference from heterogeneous points of view, examining the presuppositions of current studies or trends—e.g. species, queer, critical race, etc.—and seeking alternatives, among other places, in the underexplored intellectual traditions of modernity, the pre-histories of the modern, and the speculative fictions of the future. Linking elements of the initiative will be a commitment to finding connections among traditional disciplines (e.g., philosophy, history, political theory), established interdisciplinary fields (e.g., critical race and ethnic studies, feminist/queer studies) and (more) emergent fields (e.g., critical species studies, affect studies, critical experimental poetics). We invite applications from prospective graduate students working within or across any field(s) who think their research would benefit from examining such questions. We are open to students who are fully invested in the critical moves spelled out above as well as to those who are more familiarly engaged with questions of difference but believe they would benefit from being part of this dialogue. or the Chair, Carla Freccero, freccero@ucsc.edu.